Over at the OD&D boards, a thread on determining the key texts for a graduate-level dungeon design syllabus inspired me to think about how to design a better dungeon for people other than yourself to use. My experience running the original dungeon – 1971’s Blackmoor Dungeon – convinced me that, for the kind of dungeoneering experience I like these days, there’s not a lot of room for improvement in terms of content (and what there is was largely taken care of by 1979, when Paul Jaquays designed Lost Caverns of Thracia). However, I think there’s a lot of room for improvement in terms of presentation. No dungeon is as great on paper as it is in the designer’s mind, but I think that the degradation from the author’s mind to the DM-user’s doesn’t need to be as great as it currently is. In the case of Blackmoor Dungeons, Arneson’s intro in First Fantasy Campaign makes it clear that a lot of information got lost in the process of preparing the maps for publication; he says, for example, that he knew where secret doors were by the width of the line he drew, and had to go back and mark them more clearly for the cartographer. Trying to play the dungeons as published demonstrates that even more information was lost. Arneson also knew from deep familiarity which staircases drawn on level n connect to which staircases drawn on n-1, n+1, etc. When I’ve overlaid the maps to understand their spatial relationship, it seems evident to me that the annotations on the published map are a lot less reliable. – Which way do the doors open? – Where do those stairs lead? – What is the most important thing you should know about the contents of each room? This is useful not just to jog your memory or give you something to tell the players to buy time as you look the room number up in the module key. It’s essential to have this info on the map because that’s where you need to go for a lot of the other spatial decisions involved in refereeing the dungeon. Are there monsters in range to hear the noise the characters are making? Does a detect magic pick up anything in a nearby room? Here, the map gives us some extra 3-D information: how high up are the ledges, where does the pit go, how far down is the chasm? Like telling you what monsters are there, the reporting of treasure is also very game-useful for rods of treasure detection and the like. And noting that a dungeon element is present, but may not be visible to the players, is a basic courtesy of cartography that would have prevented any number of “oops” moments in my experience of looking at a published map and using it to describe what the adventurers see. Does anyone know of published modules that have this level of useful cartography? Or other examples of homemade maps that provide enhanced experiences over polished professional ones? I think Telecanter’s ideas about making mapping easy by presenting info on maps are a great step in the right direction! 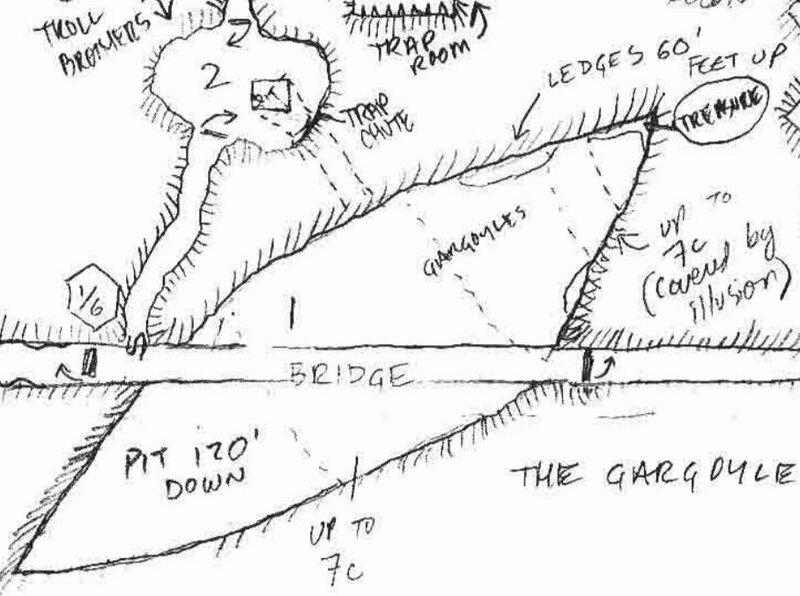 I’ve always used map notations like that for my game, but have not seen such useful info on any published stuff. It would be nice if they thought about what’s really important and how best to organize it when they make modules for sale. Seems like all too often they are confusing a module with a novel and focus only on overly-long room descriptions. Another thing I’d like to see standard: player info given in bullet points. Maybe even boxes to check off. I was just running the Jaquaysian splendor of Hellpits of Nightfang today, a little Runequest module about a vampire and his girlfriend. It’s awesome, but even though J. uses the Chaosium house style of First Glances and Closer Looks, I often found the lead had been buried, and I had to double check line by line to make sure I’d given over the info the players deserved. Reading boxed text feels silly (though I enjoy reading Gygaxian text to myself in a plummy english voice while naked), but information is the stuff of life in good dungeon crawls, so ideally a module would try to have crucial details broken down into bite-sized chunks, that the GM can literally check off as they are imparted in his own style. The 22″ by 17″ dungeon map included in Judges Guild’s Tegel Manor (1977) has a ton of information presented directly on the map. @Jack, longer room descriptions is definitely one way that module presentation has changed over time. My feeling is that this reflects a shift away from making modules to be played, and towards making them to be read. The OSR isn’t going to change the fundamental reality that folks have more time for reading than they do for playing, but I think we can try to improve the experience of the people who do play our adventures by taking into account the things we’d want to have when we DM ourselves. @IO, I am sad beyond words to have missed Hellpits! Since I don’t yet have any of Jaquay’s RQ modules, could you describe what the First Glance / Closer Looks format looks like? I like the idea of check boxes. One thing I think is a nice advance in utility is the Hackmaster modules where treasures and monsters are presented on a separate summary sheet so you can check them off (if I recall correctly). @Geoffrey, that’s awesome! I only have the Gamescience version of Tegel Manor, but using it in play I do remember that having notes like “moaning” written right on the map definitely made it easier to incorporate these sound effects when I ran it. The [original map] looks to use color for even more playability than the published one. I’ll do a post about it when Cafe Press delivers the one I just ordered. Initial Die Rolls — there’s a chance of rooms being empty, all the baddies enacting an evil ceremony you could sneak by, here’s a gorp, etc. Absolutely better than just dense paragraphs, but still a lot of stuff to extract. James is turning Hellpits into a D&D scenario, so you may get your chance. I really dug the 3d dungeons Ravenloft introduced back in the day. I never did run any of those modules though. The one-page dungeon works really well for me, but I suspect it’s a little intimidating to new DMs who aren’t confident they can improvise/wing it/etc. Any discussion about presentation has to discuss design, too. If you’re writing a plot-based adventure, your design and presentation can and should be different than a more sandbox-type adventure (like the one pagers). One is more like a script, the other is more like a machine. One of the things I’ve been thinking about lately is Justin Alexander’s essay on designing situations rather than plots. I’m working on an adventure right now, and trying to follow his advice about situation and node-based design, and the presentation is quite tricky. To some extent, all I need is some location maps, a few clues and a list of enemies, their goals and their resources. I agree that both old-school and OSR presentations & designs are best suited for DMs who do a lot of improvisation. I’m not alone in thinking that David Hargrave’s published adventures are no great shakes, but that his Arduin tables are great fodder for making up an adventure as you go along. 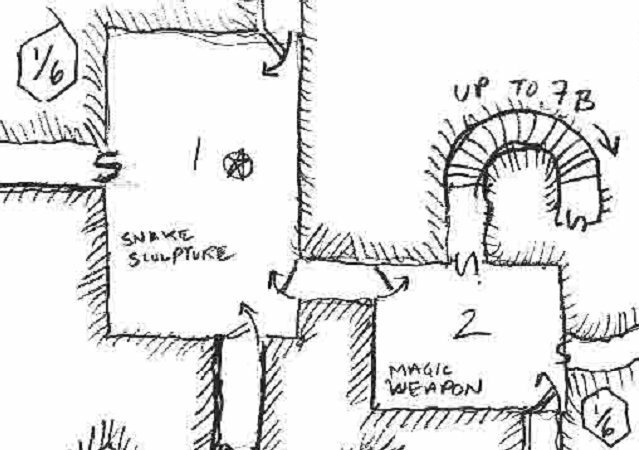 The Snakepipe Hollow format looks like a precursor of the 3E style where every room entry should cover certain categories – what the DC is to break through the walls, etc. I’m no great fan of that level of detail in the key, although I’d love it if it could be shown on the map. cr0m, I didn’t know anything about Justin Alexander but am finding his essays a joy. In cursory discussions about current gaming theory and sandboxing, I’ve lamented not knowing how to make a case about a preferred style of play vs. a righteous disappointment with plot-driven games, which I share. Creating ‘situations’ or ‘nodes’ that can be activated or used in consequence of the players’ actions. I’ve found that in creating my latest, admittedly small, dungeons, I have placed less emphasis on where monsters are room-by-room and kept in mind more the general area they are in and how they would react to new event emerging within their sphere of understanding. While it important where each group in a tower is, for example, it is more key for me to know that the small band of mischievous pixies is happy tormenting the nest of a large pterodactyl overhead yet they are terrified of the swarming rats down below. It gives the party more options available. I had info for first glance, closer inspection, and then what the DM should know, which seems like a logical minimum to help a DM running an adventure. Of course, that was all separate from the map, the map could be doing a lot more work. I have started to make maps with deliberately created room for annotation. Some features (in my judgment) warrant inclusion in a printed map, mostly physical features like where things are (“treasure here”) or how high the ceiling. Other things like room contents are better left to the individual DM to accept from the module text or customize. I would find a map distracting if it insisted on “magic sword” when I had changed the treasure to better fit my campaign. Consider B1, where the module forces you to determine room contents as prep. I regard reading, re-reading, and making notes as a key part of getting ready to run something, and the act of making the notes helps (me, at least) with understanding what is where and how it all relates. Having the content pre-printed would not help me all that much, at least for running the module. This returns to Tavis’ point about making things easy to read, vs. easy to play. Having details written on the map makes it easier for the DM to catch the richness of the author’s intent, but may make it harder to adjust the module and prepare to actually run it. If I were making a module for publication, I would use software layering to make several versions of each map. One would be the raw physical dungeon; a second would include annotations of the author’s content; the third would be the physical dungeon with editable fields so each DM could write and print their own notes (I prefer pencil scrawl myself…). Printed products would come with versions of maps one and two: the purchaser gets the author’s version if they want to use it unchanged, and a blank map to fill with their own notes if they prefer. Downloadable products would include the third – all part of a pdf or whatever. Leaving room for annotation is a good point. One thing about the Khunmar maps is that they’re not very scaled-down; you could put more map per page if you squeezed it in, but that’d leave less room for notes. Just not filling empty space with black makes it easier to annotate! Another axis is easy to run off the shelf vs. easy to prep. I heard from a publisher of a great many D20 modules that many of his fans said they didn’t read them before they sat down to DM! At the OD&D boards it was pointed out that a certain amount of easy to read makes it easier to prep; if it’s too dry it can be hard going. The 0one modules and maps use PDF software layers to do some of what you’re describing – you can put in or remove room numbers, doors, symbols, etc. They’re very cool & I should pitch them the idea of adding an enhanced information layer beyond standard cartography. @Telecanter, I’m looking forward to checking out the tower when time permits- at first glance it might be a good fit for my afterschool kids, I’m not very good with thinking puzzles. @nackered, another idea I like is re-drawing maps with different info overlaid – like in an atlas where you see physical features on one map, spheres of influence on another, etc. It might be cool to do a relationship map like @ the Alexandrian (a great blog BTW) overlaid on the room-to-room map to help you remember that the orcs live over here and this arrow means they have the key to the chest over there. I always seem to annotate maps anyway, but for different detail. For speed of play, I like to look at the map at a glance and see everything. I normally write 5 goblins, 3 zombies or whatever in the room itself or right beside the room. If needed I put the page number there too incase I need to look it up. We normally note the traps on the maps, so why not the monsters? The only reason we don’t is past convention. The only reason we don’t put monsters on the maps is a lack of space for stat blocks, ever since modules got away from providing an index of monster stats in the back. One of the great things about the OPD template is the convention of either not including stats for monsters, or having the index after the room descriptions. From a player’s point of view, I think that the typical dungeon description that I hear at the table leaves me a little cold. Verbal foot dimensions, undifferentiated archways, and doors kind of enter my ear like charlie-brown-adult-talk. I think more stand-out descriptions and abstract sensation can lead to me remembering my place and position in the dungeons more accurately than looking at our mapper’s graph paper. I think Telcanter hits the nail on the head, in that the “realistic” arrangement of dungeon walls and structures has absolutely nill effect on a player’s immersion into the situation since 99% of the time they will never know whether it is reasonable or not unless they are collecting the aforementioned dimensions and mapping the thing out. It’s the standout details that stick in a player’s mind from room to room, like the “fungus room” the “psychedelic flashing room”, or the “deep spiral stairway with hanging pillars of green light”. Why not just arrange the whole thing in a cross or square pattern? I think if and when i run a dungeon I will take a bunch of color swatches and place two big cards out on the table to represent a visual sense of each area, even if the colors are not the predominant color of the scene “realistically”. Anything to provide more sensory associations of the different regions of the setting. Well said, GG. In some ways there are two functions to room description. One is for the players get immersed and make in-game decisions. The other is for the mapper. Something I would like to experiment with is a sort of short-hand for dungeon exploring, where a DM can say “a medium sized room” and the players know he means “a generally rectangular room that’s around 30′ square”. Or “a large cave” means a roughly 200′ across, natural cavern. That way they can make a map whose primary purpose is gettin’ the heck out of dodge safely, without bogging down in measurements. And if they want to go back and start looking for secret compartments, they can say “okay, get the rope and chalk, we’re going to measure this one out” and it’ll be an in-game event. The most difficult thing for me as a DM is describing where various doors, doorways, etc are in a room. @crom: Absolutely! That’s why I started trying to make a map that would help me learn those skills, I even started listing room shapes that could be described in a word or two (triangle, semi-circle, hexagon). Then you can get on to the evocative type of description Greengoat is talking about. I find this topic exciting because I see it as a skill that I can get better at with attention and practice. @Tavis: I should say, yeah I’m not sure I’d recommend my own tower for play through; 6 puzzles in a linear tower is the train to frustration town. But I made it back in my youthful 1e days and love the idea of puzzles. Maybe people can use some of the rooms individually in their own megadungeons. I loved Telecanter’s iterations of the idea of making the map simpler (especially the earlier ones)and also liked kiltedyaksman’s idea of moving away from hastily scanning text and using the map as the dungeon reference. Knowing which ways doors open was something I never thought of, but I can see its importance from a tactical perspective. I wonder if a few extra graphical keys for consistency of walls, pools, etc.. might help my own DM phobia. Maybe what I need is a fully realized map as my reference to Gamemaster..
Look at how there’s a paradigm shift of information here, what if the text itself was more outline, less flavor text. Each significant piece has 3 details I just put down for improv. @Cr0m: Yes! I see two kinds of maps coming from those two functions. One is the quick sketch map that shows the route; often boxes connected by lines. The second usually are very detailed, meant for traditional trap and secret-door finding or for tactical combat (like how much space a fireball takes up). Part of the difficulty in articulating the author’s vision of a dungeon is atmosphere: properly done it does not include boring descriptions of how big the room is, but should focus on greengoat’s “stand-out descriptions and abstract sensation,” above. And honestly it takes a certain type of poetic genius to get that level of aestheic detail across in few words. That was one of Gygax’s true talents; not many people can sum up eldritch weirdness in just a sentence or two per room. That is a huge challenge when writing a dungeon for others to read or play. Dude, I wasn’t talking stats lolol. Just the number of monsters, it’s handy in case you forget (I’m often playing sleep-deprived) that another group of monsters is a room or two away and may hear the combat. I think Maldoor is right on point here in terms of PLAYER experience of mapping. There is a major division between “fun” and “effective” mapping techniques when attempting to map accurately. If it was up to me, I’d love to be able to “mind map” dungeons, with lots of kooky drawings, notes and diagrams representing rooms. In truth, rigorous dungeon mapping is a tedious artifact of old school play. there is definitely some satisfaction in filling in holes in player maps, finding secret doors, figuring out ways to drop/advance floors via passwall/picks/explosives. That said, I think that most players at the table, like poor Greengoat, are often bored and alienated by the mapper/DM interaction, and end up taking a backseat in deciding party actions and direction without a clear vision of where they are in the dungeon. Certainly, it’s not an all or nothing solution, but I think rigorous mapping is an old school sacred cow that should be shot! LB, I’m torn here. On the one hand, I’m one of the players who likes rigorous mapping. It’s a form of system mastery, where the dungeon is the system. And putting in easter eggs is wicked fun for both the players and the DM. However, I’m with you on the fact that it’s basically a game being played by two people at the table. I think the experience could be improved by shortening the DM/mapper interaction and making it a group concern. My gut says the best way for this to happen is with some sort of “mini map” that is revealed as you go, so everyone can see the map being “drawn” and participate. You lose the experience of getting lost underground, but that’s a pretty small price to pay, IMO. There are lots of ways to get stuck undergound while still knowing roughly where you are: sliding traps, shifting walls, crumbling bridges, etc, so you can still get the experience of being in trouble. Revealing the map could also be dependent on the type of exploration. Careful exploring, measuring and fictional mapping could be modeled by turning over dungeon tiles that show precise dimensions and room contents. Running from enemies might only give the players verbal directions, so it would be possible to have big swathes of map with missing pieces that the players generally know, but haven’t explored to the level of detail that a map implies. I’d like to try this out. Gonna need a bigger table though. Or smaller tiles.